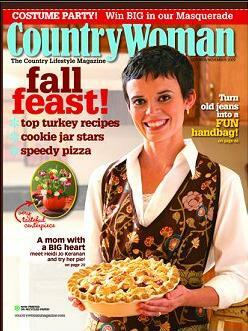 Country Woman Magazine has been the favorite lifestyle magazine of country loving women for over 30 years. Country Woman Magazine is filled with delicious country recipes, affordable decorating ideas, easy crafts projects, green thumb advice for your gardens and wholesome humor. Most of the material in Country Woman magazine is written about, and by, real country women. This upbeat, entertaining and informative publication reflects the many interests and roles of Country Women through short, photo illustrated articles about rural women doing interesting things, such as gardening, entertaining, enjoying a special hobby, running a rural based business, or spending time with family. Plus, every issue of Country Woman magazine features a large food section filled with mouth watering recipes for today�s country cooks.